Staub vs Le Creuset Dutch Ovens – Which Is Best? 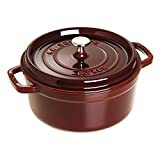 Which is better Staub or Le Creuset? It’s a case of one country’s design versus the other. While they both do the same thing, one may make it easier for you depending on what you’re used to. In this article we will cover the difference between French oven vs Dutch oven and review top rated contenders for each brand. Dutch Oven Vs French Oven - Are They The Same? Before we get in to reviewing each brand, we need to first define the differences between Dutch and French ovens. What is a Dutch oven? Dutch ovens are thick pots, usually made from cast iron, with a tight fitting lid. They're used for braising, deep frying, and baking. While some Dutch ovens rely on a traditional seasoned coating to keep food from sticking, others are coated in a layer of enamel (often colorful!). These enamel-coated dishes are sometimes called French ovens. It’s not always the case as cookware manufacturers think the distinction might confuse consumers. In other words, French ovens are a type of Dutch oven (those coated in enamel to prevent sticking). In this guide we will interchange the two terms, French Oven and Dutch Oven. This kitchen workhorse is perfect for both slow cooking and high temperature searing. It's attractive and simple design will bring centuries of tradition to your kitchen with modern convenience. One of the primary draws of this very French oven is the bright color. Le Creuset's variety of bold color offerings allows you to find a piece that will complement your kitchen and help keep your table bright. Their ovens come in black, too, if that's your thing -- but unlike other brands, the choice is in your hands. The satin interior is non-reactive and nonstick. This means that you don't have to worry about oiling or seasoning a dutch oven at all. It's easy to clean with a little soap and water, making maintaining this pot a breeze. We don’t recommend dish-washing any cookware because of its abrasive nature. One thing to watch out for is the warranty. While Le Creuest has a warranty and repair program, it doesn't cover any damages if you've "overheated" your pot. This effectively gives Le Creuest a safe out: they can claim that any damage or defects were caused by your misuse. Le Creuset offers a traditional French oven, with no frills attached. However, these ovens are a bit on the pricey side compared to similar brands like Lodge. Featuring some new innovations in the tried and tested world of Dutch ovens, Staub's pots are an excellent blend of modern engineering and traditional cooking. This pot offers a feature we haven't seen anywhere else: the inside of the lid has little bumps on it. This is an incredible feature for when steam naturally condenses on the lid, rather than running off to the sides, it'll drip down evenly over the entire dish. We can't say that we've ever had a problem where the middle of our slow cooked dish turned out too dry or the sides too wet, but the physics checks out in an elegant way. It's not like you're paying extra for this feature either because Staub Dutch ovens are on the same end compared to Le Creuset. The interior of this pot has a matte finish. As we mention above, this is a kind of middle ground between a fully non-stick satin finish and a raw cast iron surface. You can certainly use it out of the box, but it'll get substantially more non-stick if you use a bit of oil before you start cooking. It'll develop a natural seasoning over time if you let it, just like a raw cast iron finish. Staub offers this pot in a handful of subdued, tasteful colors. There's still some room for customization, but you won't get to go crazy. If you're willing to use a bit of oil when you cook, the 4 Quart Staub Cocotte Dutch oven may be ideal for your kitchen. Seasoning a cast iron pot isn't tricky, but the process is not without its downsides. Depending on the oil you use, the process can be fairly smelly and it can take a half-hour or more depending on the exact method you use. Cooking acidic foods like tomatoes or vinegar will quickly remove your coating, and you'll have to avoid using detergent when washing your pot if you don't want to re-season your pot after each time you wash it. Matte Enamel - which is duller (usually black) and requires you to use a bit of oil to keep food from sticking. Cooking fatty foods in a matte finished oven or brushing it with oil before cooking will result in the creation of a polymerized layer of fat on the bottom, similar to a seasoned cast iron pot. You don't need to worry about maintaining this layer, you can just wash it off if you want without damaging the enamel in any way. It's worth noting that cast iron retains heat VERY well. You do NOT want to preheat your Dutch oven on high and then turn the heat down later because there is the change of burning or overcooking your food or making it stick. In general, you should avoid high heat unless you're sure you know what you're doing. Cast iron retains heat so well that you can actually damage it by leaving it on a gas range on high heat. Final Thoughts - Which Is Best? Whether you're baking bread, slow cooking, or searing a steak, cast iron offers superior heat retention and is a wonderful addition to your kitchen. 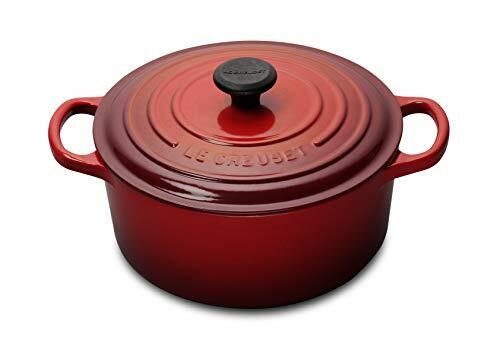 Now that you know about the different coatings (seasoned cast iron, matte and satin enamel), you'll be able to choose the right Dutch or French oven for your kitchen whether it be Staub or Le Creuset. Did you enjoy this guide? Let us know in the comments with your experiences and if you prefer Staub or Le Creuset. Staub is superior. That isn’t much of a statement however because Le Creuset is far and beyond excellent itself, but the Staub offerings are a notch above. All that said though it’d be great if you knew that Staub is also French in origin and current manufacture. Both of the Dutch ovens you’re comparing about are French ovens I’m afraid. As a dutch men I own the Staub as well as the Le Creuset. There is a big difference in the type of lid. The Le Creuset lid hangs on the inside, when pressure rises in the pan the lid starts breathing. Condensation and sauce drops and can exit the pan easily. The lid of the Staub is covering pan over the edges. The lid is much heavier then the Le Creuset and much more tight. The drops under the Staub lid is a nice feature, but the Le Creuset is made in a way so the condensate will run down the sides. So both are good lids, but the dutch ovens are used in different ways. The Le Creuset is more used to prepare meat rolls, as for the Staub it’s more used for steaming (with the extra steam filter inside) or to prepare meat which has to slow cook in a sauce. But both are great, it’s worth the price considering it’s a product which will last a lifetime. Mark! Thanks so much for your experience and tips on cooking methods using these Dutch ovens!